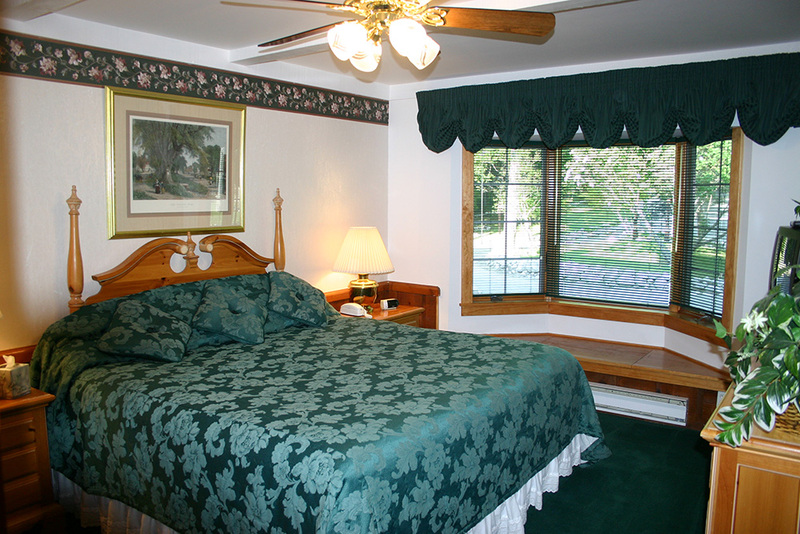 This beautiful Suite has a living room with fireplace and sliding glass patio doors which places you on a balcony facing the Straits of Mackinac and the Mackinac Bridge with awesome sunsets. The floor plan has a kitchen with a refrigerator, microwave, coffee maker, and toaster oven. The dining room has a bayed window with views of the Straits. 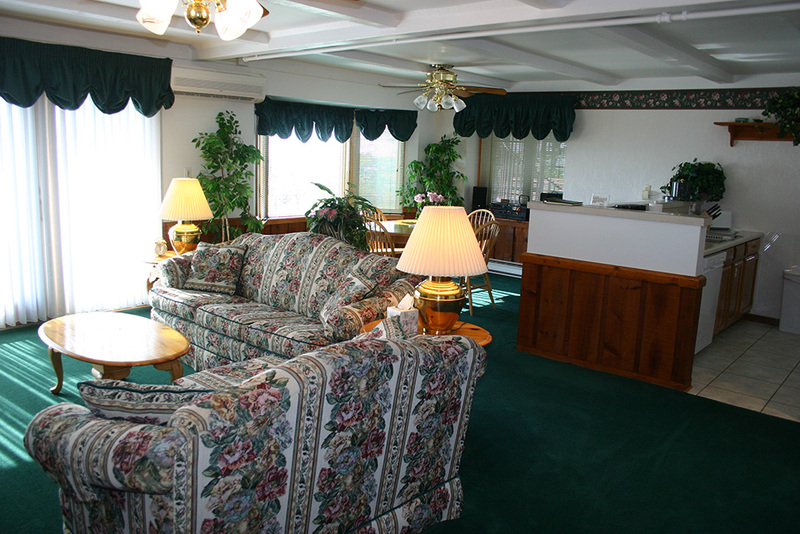 The Living room has a sofa, flat screen TV, DVD player and VCR's along with a stereo and free WIFI service. All of this is nestled in front of the wood burning fireplace. There are sliding glass doors placing you onto a private balcony that overlooks the Straits, Mackinac Bridge, and a back yard with a 175 ft.deck. The Master Bedroom has a king size bed along with a bayed window seat, which faces the front of the building looking onto the wooded grounds of Stonecliffe Estate. There is a master bathroom that has a oversize whirlpool tub and separate shower. 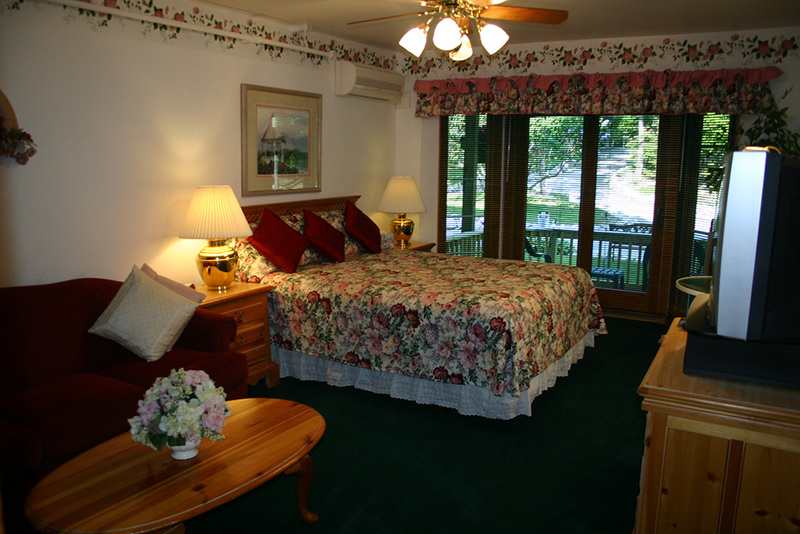 The Second Bedroom is actually our Gardenview suite that is attached to our Spacious One Bedroom Suite. This unit has a queen size bed, a sofa,flat screen TV, DVD player, plus a alcove with a small bar refrigerator, microwave, toaster and coffee maker. The bathroom is large and has a oversize whirlpool tub and separate shower. This units connects to the One bedroom suite plus it does have its own entrance.There is a sliding glass door that places you onto a private deck which faces the front of the building and has views of the wooded grounds of Stonecliffe Estates.